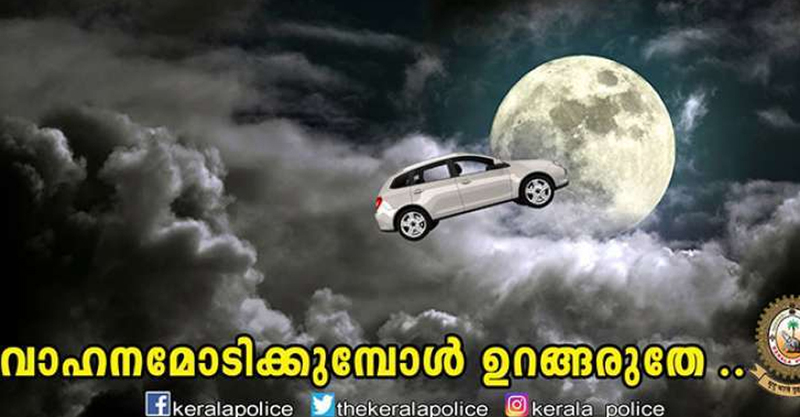 In the wake of road accidents caused due to dozing off by drivers, Kerala police have come forward to alert the drivers to stay awake while driving. The police have alerted the drivers in a recent Facebook post on their official page. “It is difficult to stop yourself from falling asleep no matter how good a driver you are. It is observed that most of the accidents during night hours took place when the driver fell asleep,” police noted in the Facebook post. The police asked the drivers to stop the vehicle and take rest if they feel sleepy when behind wheels. “Frequent snoring, rubbing eyes, feeling tiresome, difficulty to concentrate on road and blinking eyes are the signs which shows you are sleepy. You must stop the vehicle. If you take rest while driving in a long trip, it will reduce the chances of road accidents,” said the police. As a precaution to avoid accidents, the police alerted the drivers to avoid late night and early morning drive. “If possible avoid driving during late night hours and in the wee hours till 5.30 am. During this time, the chance to fall asleep is high. Drivers in the vehicle that is coming from the opposite direction may be overspeeding or would be half asleep. We should be watchful because more accidents are caused during night hours and in early morning,” cautioned the police. The Kerala police came with such a post following the tragic accident of popular violinist Balabhaskar and his family. Balabhaskar’s two-year-old daughter was killed in the accident and he is under treatment with severe injuries. It is learned that the accident took place when the driver fell asleep while driving.